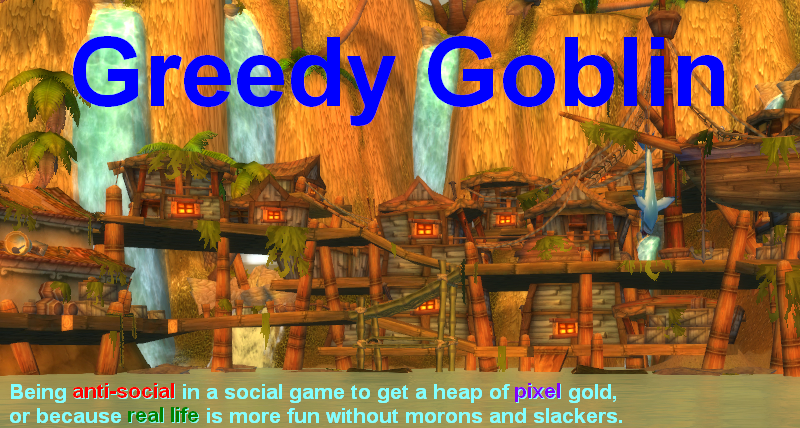 WoW's economy seems to be an unregulated free-market system. However it has several unique properties that makes it a completely different economy than the one we are used to in RL. The first unique feature is the lack of second-hand market: In the game, all and every item (except for grey and white gear) are prohibited from second-hand use. The gear pieces (except for grey and white gear) become soulbound when equipped or even when gained. You cannot sell your old gear to less geared players. The BoA is not an exception from this rule, as you can send BoA only to yourself. It's simply a shift from the character-centered design to a player-centered. The point is that you can't sell gear to players. You can sell it to vendors or disenchant them. The mounts, pets, bags, bag slots in bank, guild bank tabs and so on are non-refundable. You cannot sell them even to NPC-s. The guild bank tabs can be sold to other players by selling the guild itself, but that a solution only if the guild itself is dead. The tradeskill materials can be traded freely, but their sole purpose is to create an item, and the resulting item will eventually becomes soulbound. Second hand market is one of the most obvious things in any economy. You don't trash your 5 years old car, but sell it to someone who is satisfied with such a car for a smaller price. Also it would be funny to demolish your home when you move. In the real world, the life-cycle of every valuable item is to be bought high, to be used and to be sold for less. This way the same item travels down the financial ladder. Every time it's more obsolete or decayed, so sold for less. The travel of the person on the same ladder is similar. Your first car is usually an 8-12 years old crap in young age, that you'll feed to the shredder after you got your first year's salary and you buy a 4-6 years old, still fine car that you use 3 more years until you pay more pressing fees or getting a promotion, when you buy a 2-3 years old car that you'll use another 2-3 more years before you buy a new one. The "soulbound" issue is quite counter-intuitive and must be explained. I mean it should be obvious that new players use second-hand items that were replaced by more advanced players. So we have a very rigid and strange government regulation: "you must not sell second hand items". The explanation will come in a following, philosophy post, for now I just say what it's not for: to prevent hacking. While "people hack my account just to sell my top gear" is a valid fear, it could be countered by making your current gear soulbound, and automatically un-soulbound every item that you replace with a better one. Strike that this would protect you more than you are now, as the top gear (PvP and PvE for different specs separately) could be impossible to disenchant and vendor. The second unique feature is the vendor-only system. You cannot repair your gear, only vendors can. You cannot craft or even loot certain gear pieces, only a vendor can sell you. You cannot learn skills from other players who already know it, you can only learn it from a vendor. The vendors have fixed prices and unlimited supply of items (except for a few, not essential limited stock items). They also buy "vendortrash" in unlimited amount and for a fixed price. The vendortrash and the daily questgivers are not strange features. Any government are capable of creating currency out of nothing. However governments cannot create items. To make the real world similar to WoW, the government must have lot of workers (the NPCs) who create large amount of high-quality items for low fees. We know that it's impossible. It seems that the general rule is that: "a player does not need another player's work to get everything. He can only get marginal and relatively unimportant items from other players, the important things are either soulbound or supplied by vendors only". As businessmen we must adapt to these strange regulations and find the ways to make gold within the rules. We must keep in mind that we are not needed. So we can't dictate prices. Our items may be wanted by players, but they can live without it. That's the main reason that no cartels can exist in game. The moron-letters are moronic exactly for this: even if they could achieve full cartel, and dictate the prices of gems, glyphs or flasks, they would have very low income as only HC players would accept these prices (in absence of friendly crafter), the others would simply run around without gems, enchants and consumables. To form a cartel you must sell something that the buyers need to buy. There are cartels on the electric supply, but no cartels or even cartel attempts on soda, simply because people would drink water if all soda would be expensive. In absence of effective cartel options we must get sales by either being the cheapest or simply selling something that the others don't sell, for a high, but still reasonable price. So you either undercut (by 1c & camping or deeply), or you seek an uncontested niche. You can't expect to sell high on a contested market. It's normal that the prices go down. Soulbound gear is soulbound to make players waste time (=RL money in subscriptions) to get it. If they could be second-hand traded, as content time passes, the lower tiers of gear would become flooded with items, so that everyone could get a decent gear set with minimal time/effort. However, I disagree with your car comparison. A car not only gets old, it breaks too, and you cannot pay ANYONE a modest fee to fix it to be like it was brand new. Basically, the second-hand sale of equipment would archieve the same thing as now, but only difference would be that instead of being paid by the government to buy your gear (badges, you pay time), you'll pay other players to buy your gear. If second-hand trade would be allowed, everyone would progress as fast as their wallets(=business smarts) allow them to. We can't have skill and competence make people play (pay) less, now can we? Nooooo, Blizzard. Also, you said that everyone would run around ungemmed-unenchanted. Not true. Not even the HC raiders would pay too much. There's trivial competition in forms of in-guild crafters. A HC guild would just place an invoice tab in the GB, with the raw gems/mats, and the guild enchanter/JC(can even be an alt) will log on, craft 20 gems, enchant 30 scrolls and be done with it. Any average level 80 is at least capable of getting 500/gold hour, so they can get in the business of competing (trivially, like above or non-trivially, by entering the market directly) with the cartel within 4-6 hours. You can't tell me that no HC raiding guild on any server has a single JC/Enchanter alt between all 25 or so players. Thus, it's always profitable to be a cartel-breaker. And undercut the cartel. In real life you can't just build a power plant with 100 dollars or whatever, and start competing with the energy cartel. Not to mention in RL, you can be threatened by physical violence if you violate a cartel rule. What's a cartel gonna do in WoW? Send you some really, really REALLY angry letters, 'disrespecting' you. OH THE HUMANITY. One interesting tidbit is that one of WoW's spiritual predecessors, Diablo 2, did not have soulbound items. Instead, players quickly learnt to hoard personal armories of items that could be useful someday. That multi-piece set that's starting to run out of steam at later levels is going to make your next alt an unstoppable killing machine at level 6. Naturally, there were downsides. Because characters could effectively inherit gear, powerleveling became commonplace. Why play through all those levels when you can have a level 75+ character ready and fully kitted out in a matter of hours? Soulbound items were an attempt to fix that. Also, storing all that potentially useful gear for every player requires a lot of disk space. I remember having seven accounts just for storing gear, and that was a relatively minor gear collection. Soulbound items "fixed" that together with the removal of free accounts. So true. As an example, what's Coke's biggest competition? Not Pespi, but your kitchen tap. The lower tiers of gear are *already* flooded with items. Everyone can indeed get a decent set of gear with minimal effort. Un-binding all items of X tier below maximum would not change the availability of gear in any significant way. I agree that the influence of player professions on the WoW markets is minimal, because indeed hardly any item of interest is crafted. Crafting is a strange profession in WoW. In real-life a crafter posseses a talent or a skill that took many years of learning and which requires many hours of zealous labour to create a product. The closest we get in WoW is that it takes you a couple of thousand gold to powerlevel your profession, but after that crafting is a skillless action of watching a progress bar for 30 seconds. If crafting were to be a profession that people would be willing to pay for, it should require skill/talent (not everybody should be able to do it or at least not equally good or efficient) and time. The only way you can earn some gold at crafting is by obtaining a rare recipe, but strangely enough those are not acquired by investing time in your profession, but by raiding. So the players who are not into raiding, but want to focus their game time on developing their professions are left with recipes for making iLvl 200 blue items, that even the most green just-dinged-80 player won't buy, because he will be handed free purples by the game in a couple of hours. good analysis. But creating a second hand market would lead players to play less, as the HC would quickly fill the AH with cheap 250+ epix. It's a money sink. Pure and simple. They need to give new money to people all the time, because otherwise most people would never be able to get any. Therefore, they need things to *remove* money from the game, too. Mudflation would be so much worse, otherwise. You are wrong about governments being able to print money out of thin air in all cases. For example, the government of USA can't print any money, they borrow everything from a private bank cartel Federal Reserve, which have the rights to print the money out of thing air AND lend it to USA government. WoW just needs such item and gold sinks, otherwise old servers would be just flooded with endless piles of items. Also I would not mind a system, where items would have something like exponentially increasing repair costs (derrived from their age). So you could send an item to your alt and use it for a while or even sell it to AH afterwards. The items would naturally get vendored/de-ed when their unkeep cost would be just too large to sustain. Therefore 1-2 years old items would go out of economy the same way as 20-30 years old cars go out of economy by getting recycled. I just hope they leave the Diablo 2 item system INTACT also for Diablo 3. This is pretty basic economics. The closed system that WoW represents has a zero-effort input. Monsters spawn from thin air (costing no resources to the economy) and provide cash and cash equivalent items. Without an equivalent zero-effort output you will end up with a hyperinflated economy. It's happened in a great many previous online economies since the MUD days. The big check used to be permadeath, but as games got more commercial that became less attractive. As it is inputs remain greater than outputs, mainly because the playerbase can increase inputs by simply killing more monsters, faster, while the outputs we do have (gold sinks, travel repairs, vanity items) are less flexible. Blizzard doesn't put the cost of old flight paths up as we get richer, but it does add in new ones with each expansion and they're more expensive than before. Most players have more money now than they did a few years ago, which is important to keep the feel of 'progression' that is the main attraction of an MMO. So gentle inflation is the goal for Blizzard, but it's a hard one to balance when your playerbase can radically affect your income. The fix is a more real-world like dynamic pricing system. Currently Frostweave has a fixed vendor price. What if that vendor price was based on the amount of Frostweave currently in the economy? As more is farmed, the vendor price falls. But that's a fair bit of work to get to code in, and players may be unhappy about the lack of stability. On a side note, isn't saying that all governments can produce money out of nothing a large simplification? So while you can buy gold, there is a very limited selection of end-game gear available for gold thereby forcing you to play the game if you want gear. Personally I miss Diablo's economy and I'm in doubt whether Diablo III will be similar at all - there were huge trade forums instead of the AH, you could actually reroll any class and just equip it quite decent as soon as it was high enough and by just playing the game you could make quite some money off ebay. PS: Not saying you can't do all this in WoW - it's just so limited. However governments cannot create items. To make the real world similar to WoW, the government must have lot of workers (the NPCs) who create large amount of high-quality items for low fees. We know that it's impossible. What about middle eastern oil, it seems to fit this perfectly, not that they are run by a government however. If there was a secound hand marked that would propably ruin the blacksmithing, tailoring and leatherworking proffesions completely, it's already very easy to get better epics than the once theese professions can craft, and making countless people able to use the same titansteel destroyer would make crafting new ones meaningless. When you sell a used car in RL is it not as good as it was when it was new, in wow all titansteel destroyers are equal, and getting a new one would be pointless if a used one costs less, to make a marked for used items, items would have to permanently have their usefullness redused, not a simple durability loss that can be repaired and dos not affect damage untill it reaches zero. It migth be a good idea to introduse a salvage proffesion, where a player can attempt to salvage some materials used in crafting the item, like a gathering from used goods consept, and players with this proffesion could posess but not use other players soulbound gear, beyond that i don't think a secound hand marked would be a good idea. As for the printing money part, it is possible for a gouvornment to print money out of thin air, but not smart, introdusing large amounts of money into an economy will caouse infaltion, and essentialy the gouvernment can only print paper, and not create values. the value of the money in the system will be roughly the same regardless of how much there is of it. Look at Germany in the 1930's they tried to print money to get out of an economic crisis and a poor mans dinner soon costed millions. A wow example of this is the infaltion that followed patch 3.1, when dailies at the tournament gave other rewards than money (emblems), lots of players who noamaly got their income from gathering or crafting, now got lot gold from NPC's to, cause they wanted badges to buy mounts and pets. The gold comming out of thin air caused a sustained infaltion that no other patch has ever caused. Other patches have caused infaltion, but only cause of the increased demand for raid consumables and such, and only short term. I think that one thing to note about the 'real world' these days are digital media distribution models and the move toward the idea of buying a temporary license rather than a physical product. The large media and game companies ideally want every purchase of entertainment products(such as movies, music, and games) to become effectively "soulbound," preventing a consumer from sharing a purchased item with a friend(free advertising). I'd like to see a system that works something like this. I'll explain in WOW terms, although it could just as easily apply to any MMO. Items can be "released" (can't think of a better word right now) from being soulbound by an appropriate crafter (e.g. blacksmith for plate), which causes them to drop to the equivalent item from the tier below. However, re-binding them requires ingredients that are equivalent to the emblems that drop from heroics. Rather than being able to buy items directly (as they do now), players would need to use their emblems to pay a crafter to re-bind items that are no longer needed. 1. Crafting skills always remain relevant, no matter how powerful the gear that is currently dropping. 2. There is a good income source for progression raiders selling their second-hand gear. 3. Players would still need to work to gather emblems if they want this lesser gear. 4. There's less arguing about people getting "welfare epics", as by doing this they are subsidising those who are doing the harder content. 5. It's always possible to "catch up" to the gear needed to start the latest tier of content, even if you are a late joiner. It won't necessarily give you the ability needed to go with it, though. One of the points EVE Online players make is that virtually all the items are makeable by players. And only a few items become soulbound on use. This is why all my alts have the mooncloth bag or the traveller's pack - 16 slot bag that is reusable if i trash the toon and resaleable once the frostweave bag prices crash. The term for governments creating currency independent of the economy is "fiat currency" and tends to be used pejoratively. In WoW, arbitrage plays a significant role. Netherweave cloth will never drop below 15s because of bandages. Gems that vendor for 3g wont drop much below 4.5 if the cut version can be vendored for 4.5. Gem prices affect and are affected by ore prices. Jessica caps the ink ratios. Enchanting prices can raise cloth or ore prices. Only an incompetent cartel would price the casuals out of their market by maximizing price. Competent cartels would maximize total profit and would price discriminate whereby BiS goods would be far more expensive than stats would indicate. I think you overestimate the rationality of M&S (how many times have you overestimated the M&S? grats! lol) regarding their automobile. A common problem for those with money and money management problems is "too much car." "the life-cycle of every valuable item is to be bought high, to be used and to be sold for less" is certainly not true for many things: people buy farm or timber land hoping to sell it in a few years for a mall or housing development, homeowners [used to] expect their home price to go up, art and coin collectors. Even collectible automobiles increase in value. BoP does not really protect you from hackers. I know 2 people where the hacker destroyed the gear, perhaps to free up slots. or spite. I am always bemused when at a public event, I see bottle water selling for the same or greater than Coke. I think the reason cartels don't exist (or don't exist for long) in WoW is that there are too many suppliers and relatively low barriers of entry. The only time a cartel might exist is at the release of new content. The first people on a server to get a new recipe can band together and set prices, but as more people get the recipe, the cartel gets weaker and weaker. I'm not sure how your idea of making a character's top gear unvendorable and disenchantable would work. Does the player determine whether something is the top set? (Can the hack then just unselect it?) Or does the game do it automatically (how is the game going to weigh the various items - highest item level is not necessary the best item for the character. For Dps I have different items I swap if depending on how much hit I need? I don't understand why people try to compare certain things in WoW to real life. Zazkadin seems to have missed the point that WoW is a game, not a real life simulator. Its not meant to be realistic and any elements of the game that resemble real life are merely coincidental. Bliz made the decision of have soulbound items for various design/gameplay reasons (which Gevlon will enlighten us). I doubt the fact that items don't become soul bound in real life kept the developers up at night. One thing is the economy does not act completely like the real world. In the real world it cost money to live. It costs money to stay somewhere and to travel even if not flying and to operate the car and food to eat. In WOW food and drink is not needed for day to day operation of any toon. My toons like my various storage toons and bank toons and such need none. So it costs money to live but not in the WOW world unless of course you adventure. The game IMO is too easy to make money and trade equip between toons. There are no big costs for toons other than equipment, repairs and various food items. Flying travel and mounts are optional and if not aquired hinder game play but are not needed except for a few flying quests. So people be careful what you wish for. That said I do think one should be able to disenchant an item if one does not own it and it is soulbound to another. It would work similar to enchanting soulbound items that one does not own. Much like real world corporations, players have to work together in guilds to produce and consume anything of high value. Everything on the auction house is optional items of lower value. There are no cartels however, because resources are so abundant and barriers to entry are very low.